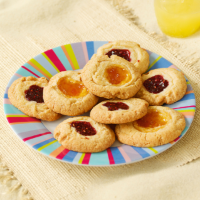 Children will enjoy making these crumbly cookies filled with their favourite jam. They’re just right for popping into lunch boxes and picnic bags. Preheat the oven to 180°C, gas mark 4. Line 2 large baking trays with baking parchment. Place the butter and sugar in a mixing bowl and beat using an electric whisk or a wooden spoon until pale and fluffy. Add the vanilla extract and continue beating until well combined. Using a metal spoon, fold in the flour and baking powder until the mixture forms a soft dough. Take a small piece of the dough and roll in your hands to make a ball. Place on the baking tray then repeat to make more balls, leaving a gap between each one (as the mixture will spread during baking). Repeat until all the mixture has been used. Make an imprint into each ball using your finger, deep enough to hold a little jam. Carefully fill each cookie with about ½ teaspoon of jam, making sure you don’t overfill. Place in the oven for 15-20 minutes until lightly golden brown. Carefully transfer to a wire rack and cool completely before eating. Perfect with a glass of orange squash. You could try other fillings for the cookies, such as lemon curd or even giant chocolate buttons. The cookies will keep in an airtight tin for up to 3 days. This recipe was first published in Sun Jun 01 01:00:00 BST 2008.